For a copy of an accident report, please contact Joyce Shaw at 330-658-2181 ext. 1120, or come by the Police Department at 20 S. Portage Street between 8:00 am and 4:30 pm, Monday through Friday. 2. What do I do with a stray dog? 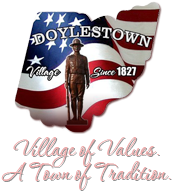 The Doylestown Police Department will not take stray dogs running at large unless the dog is vicious or dangerous. We will investigate and hold individuals accountable for their dogs running at large but we do not have the facilities to house stray dogs. The Doylestown Police Department recommends that you never approach or attempt to apprehend any unfamiliar animals. If you do come across a stray dog contact the Wayne County Dog Warden at 330-262-0152. 3. Does the Village impose a curfew? Yes. Minors (under the age of 18) Sunday through Thursday 11pm to 5am. Friday and Saturday 12am to 5am. 4. Is there a noise ordinance in the Village? Yes. Between the hours of 11 pm to 8 am. Offender must be put on notice by a police officer after that officer has observed (heard) the actual offense and has deemed it a violation of 509.09 before criminal action can be taken. 5. Is there a policy on open burning and who do I contact?